Gift of Mr. and Mrs. Edward W. Lane, Jr.
Cardinal de Richelieu, born Armand Jean du Plessis (1585 – 1642), was eventually the virtual ruler of France. Bernini completed a marble portrait bust of the Cardinal in 1640. The pre-eminent sculptor and architect of his day, Bernini's work is characterized by the dramatic play of light and dark seen in the deep carving of this piece. The solemn, piercing gaze of the Cardinal and the slipped button on his lapel silently convey the dynamic tension for which the artist was known. 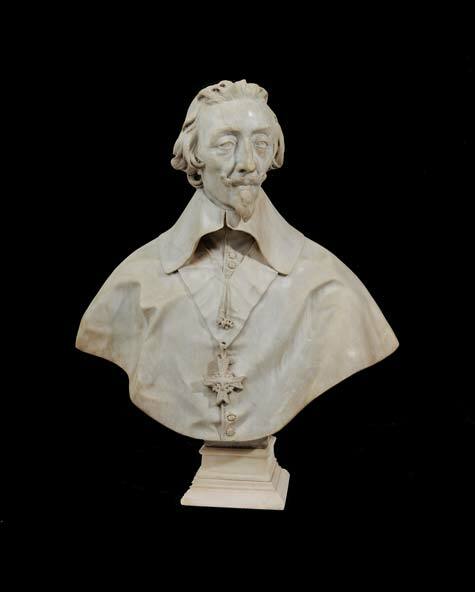 This sculpture is one of several nearly identical marble portrait busts of Richelieu credited to Bernini's workshop or assistants. Similarities between the drill marks and details found on this bust and the original, at the Musée du Louvre in Paris, suggest that this marble was created in Bernini's studio in the presence of the original. Bernini executed the original bust in Rome while Cardinal Richelieu was in France. Access to a triple portrait of the cardinal by Philippe de Champaigne (1602 – 1674), showing Richelieu from three angles, made it possible for Bernini to carve a close likeness. The number of 17th-century copies of this work attests to the popularity of the original at a time when studio assistants were producing sought-after replicas under the supervision of their masters.